Had a brief visit to the doctor today for a follow-up. He said the bone is healing well, and that I can return to activities such as swimming as long as there is no pain. Hoping to start ramping things up soon. Was riding to work this morning on my bike. I had just crossed into Lowell along Pawtucket Blvd, where the road is relatively wide, with a wide shoulder good for cycling. I must have hit something in the road, or some broken pavement, because my front wheel twisted and I went down on my right shoulder. After getting up, and getting myself brushed off (and thanking the Lowell Police offer who stopped to ask if I was OK), I realized that my right shoulder was sore, and I wasn’t going to make it to work on my bike. I rode home, and after taking off my reflective vest, jacket and other cool weather gear, I went up and had to wake Joyce. 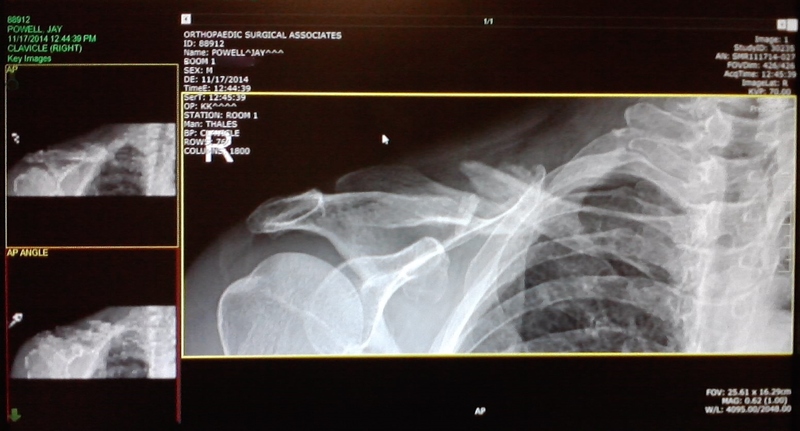 Joyce took one look at my right shoulder, and said “… you’re going to the emergency room.” After checking to ensure the kids knew we were leaving and they were to get themselves ready and out the door for school, off we went. 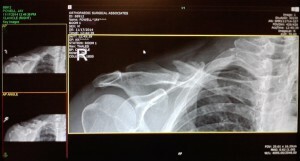 After x-rays confirming my collarbone was broken, the doctor said no exercise for the next four weeks. Baystate Marathon is out this year. With luck, I will be able to run Tyngsboro Trot and get myself ready for Mill Cities Relay. The goal for 4,000 miles under my own power for the year is probably out as well. I did make it (to date) to 3,157 miles, perhaps I can add a few miles more after this all heals in November and December. Posted on September 24, 2014 September 25, 2014 Categories Cycling, Injuries, Running, TrainingLeave a comment on Crash!